Greenland Homes builds its fourth charity home for Children’s Cancer Connection. When you start a home construction business during the most difficult housing downturn in memory, you really appreciate the good years. Corey Kautz, founder of Greenland Homes, speaks from experience when he says that it’s important to find a way to give back to the communities that help you grow. Several years after entering the construction field, he opened Greenland Homes. That was in 2008. 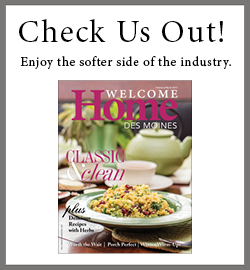 Founded in 1988, the Des Moines-based charity focuses on encouraging families. Its website states, “While many great organizations are working to find a cure for the disease afflicting more than 13,500 children each year in the United States, Children’s Cancer Connection strives to provide care following a cancer diagnosis.” In addition to various camps each summer, the organization offers hospital-based services and other family activities year-round. Greenland built its first charity project in 2011–2012. Since then, the company has donated over $200,000 to the Children’s Cancer Connection. “I think it’s more than 500 kids who have attended camp as a result of our donations,” Heckart says. Both Heckart and Iowa Realty donate their commissions on the home, and Greenland donates all profits from the sale. Many of the subcontractors and suppliers donate their services as well. This year’s project marks Greenland’s fourth home for the Children’s Cancer Connection. The four-bedroom, two-story home in a new development just off Alice’s Road in Waukee features many upgrades, including wide-plank engineered-wood flooring, a stone fireplace, painted cabinetry, and tile showers. Each of the charity homes has another very special feature. Inset in the front step is an engraved tile marking the home as a Children’s Cancer Connection project. The previous Greenland charity home resulted in $100,000 in donations. That means even more children suffering from cancer, and their siblings, had the opportunity to spend a week at camp last summer, a week where life could be normal again. “That’s why we do this—so these kids can just enjoy being kids again,” say Heckart and Kautz. Greenland Homes may have started the charity builds as a way to give back to the community, but the builds have made a deeper connection that extends much further. Everyone, including employees, subcontractors, and suppliers, now has a vested interest in the work the Children’s Cancer Connection is doing. And this summer, there will be a lot more laughing children at camp because of it.